From the Statuses tab, you can update an offer's status information for the offer itself, the contract, a loan offer, or a cash offer. 4. Locate the status you wish to update, then click the drop-down arrow next to Choose... in the appropriate Change Status field. 5. If the effective date of the status is any other day than today, indicate that in the Effective Date field; otherwise, skip this field and Broker Brain will automatically enter today's date when you click the Update button. 6. 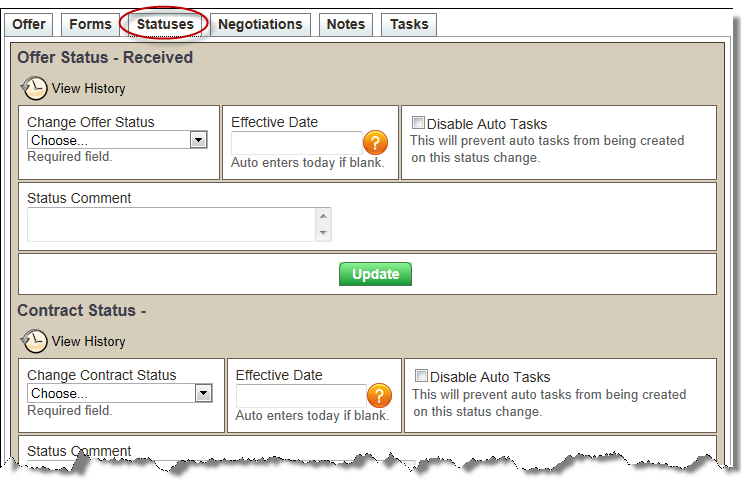 If any Auto Tasks have been created to generate when an offer status changes to the status you are about to select and you do NOT want this to occur for this offer only, place a check mark in the Disable Auto Tasks field. 7. Place any desired comments in the Status Comment field.